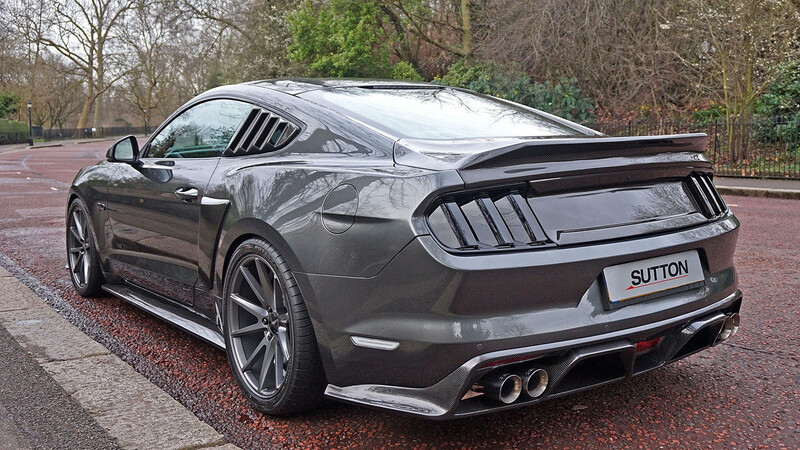 London supercar dealer Clive Sutton, through its “Sutton Bespoke” outfit, is introducing a new, 800-horsepower Ford Mustang for the UK market – so that finally, the British may have tuned, high-horsepower ‘Stangs to rival those on offer in the US. Remember: the Ford Mustang wasn’t even officially sold in RHD markets like the UK until last year. Dubbed the “Sutton CS800 Mustang,” the latest pony car from Sutton Bespoke makes its power with a Stage 2 Whipple supercharger, long-tube exhaust headers, high-flow catalytic converters, and an active, quad-tip exhaust, reports Motor1. The throttle body and fuel system have been upgraded to support the blown 5.0L’s greater thirst. Helping to keep all 800 horses in check is a 3-way adjustable suspension, plus a carbon-fiber front splitter and decklid with an integrated spoiler for downforce. The rest of the CS800 Mustang’s exterior looks just as wild, too, with a gaping Super Snake hood, and a custom rear valance and side skirts, again rendered in carbon fiber. The Sutton CS800 Mustang was officially unveiled at the Top Marques Monaco luxury products expo, where a price tag of £64,950 (about $83k US) was announced. That places the new, high-horsepower pony car rather on the expensive side, to be sure, but consider this: it’s still well below the base price of a Porsche 911 Carrera, and delivers more than twice the horsepower.